Having recovered from yesterday's horrendous rota writing episode and completed today's DIY chores, it is now time for a puzzle review - again, one of the more affordable puzzles. 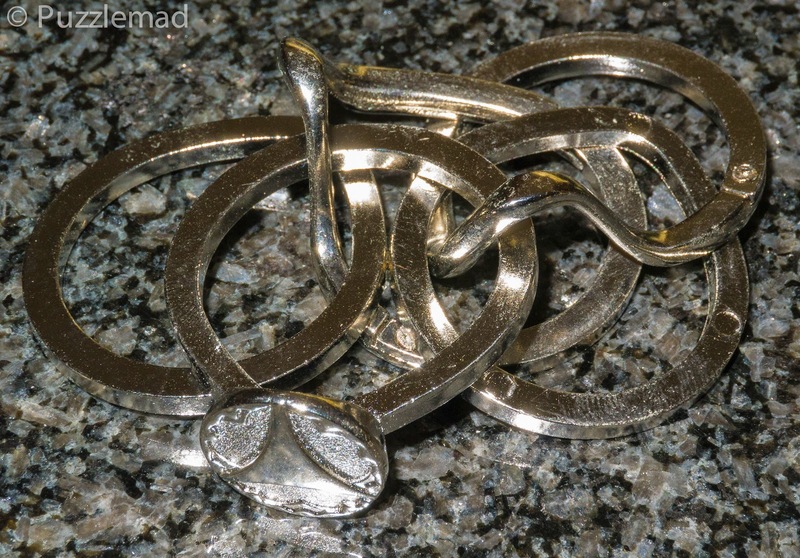 Today it is another from my Hanayama stash, the Cast ring II. 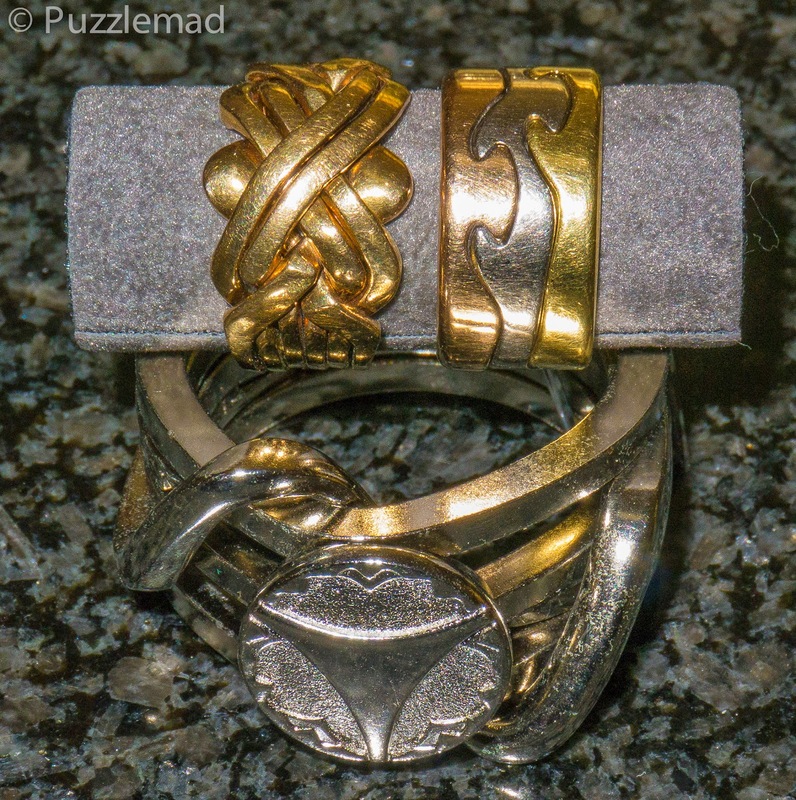 I do not own the Cast Ring I and chose this one because of the high difficulty rating - it is level 9 (Gruelling) on the Puzzle Master scale and a 5 out of 6 from Hanayama. As with all the others, it arrived in the lovely black Hanayama packaging and when I picked it up I realised that "ring" is a bit of a misnomer! I had not really looked at the full description on the product page and did not see the size. This is only a ring in terms of shape - you are NEVER going to be wearing this on your finger! It is enormous! 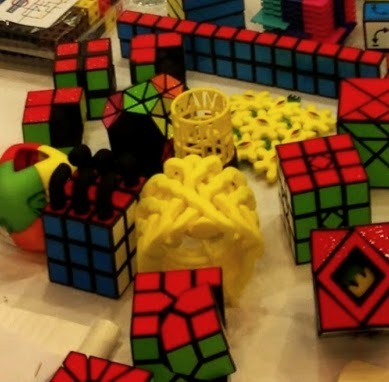 The dimensions are 4.4 x 3.9 x 1.5 cm making this even bigger than your thumb but not big enough to be worn by a girl as a bracelet (Rox wore a fabulous huge Oskar 3D printed puzzle ring as a bracelet at the IPP - to the right is a photo of it on Oskar's table at IPP). I noticed that as soon as I took it off the backing card that this puzzle is extremely unstable - it just wants to spring apart. I therefore kept one of the wire ties on it for storage and photography purposes. 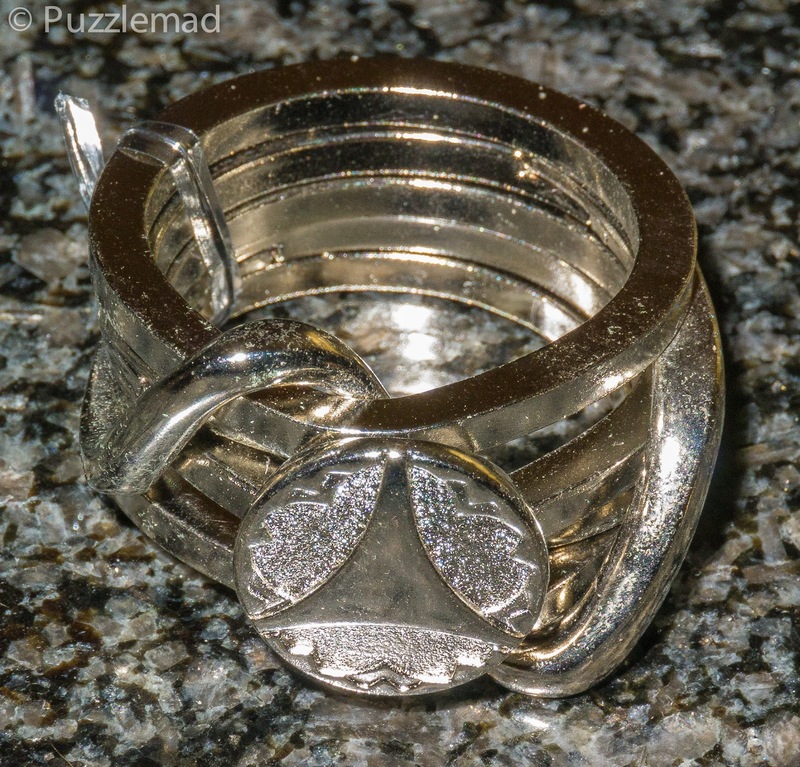 This is the 3rd puzzle ring in my collection. I have a 6 band gold one which I seldom wear but play with intermittently to keep my memory up to date. 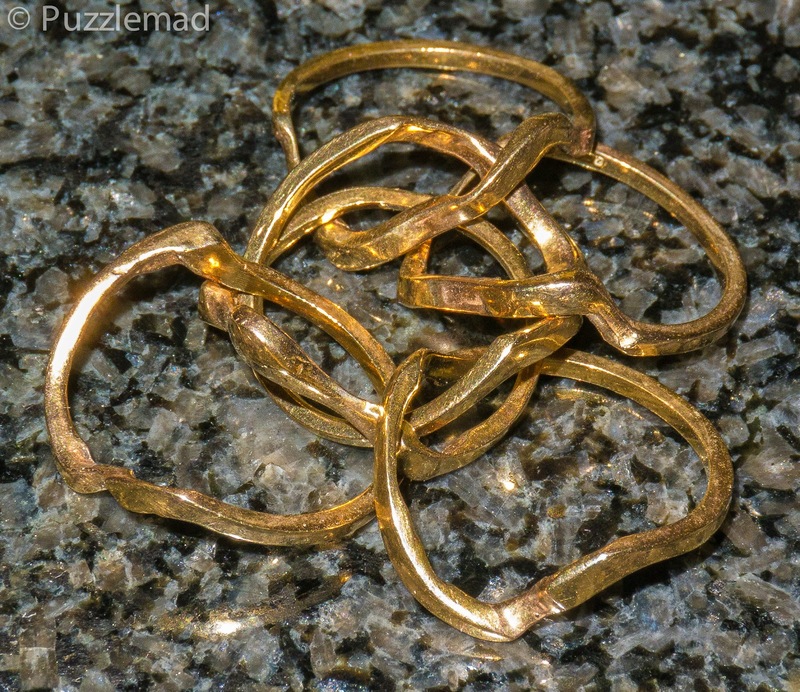 Many puzzle rings on the market are based on a similar mechanism of interlocking and it is useful to be able to do them for the occasional time when confronted by exasperated friends and colleagues who have a similar ring but cannot reassemble it. Over the years I must have done 15 or so for people! 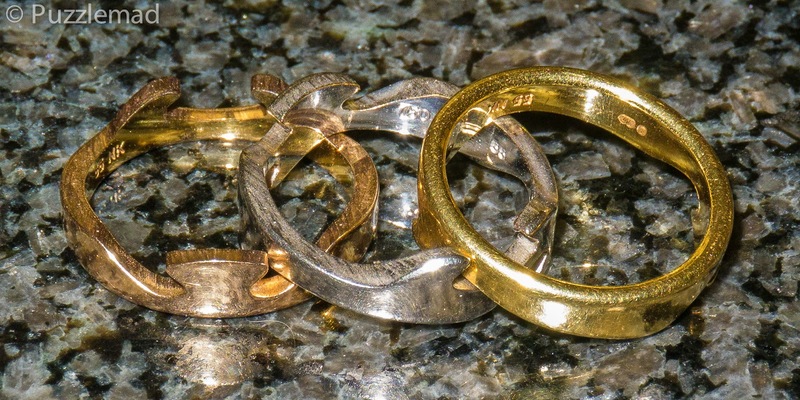 The other is a jigsaw ring in 3 colours of gold designed by the amazing Danish Jeweller, Georg Jensen. It is not in any way puzzling but I have been told many times by colleagues that it is wholly appropriate that I should wear it. This is my preferred ring to wear because it was bought for me by the present Mrs S (doing OK for a first wife!) for our 10th anniversary - she received something equivalent with diamonds in! 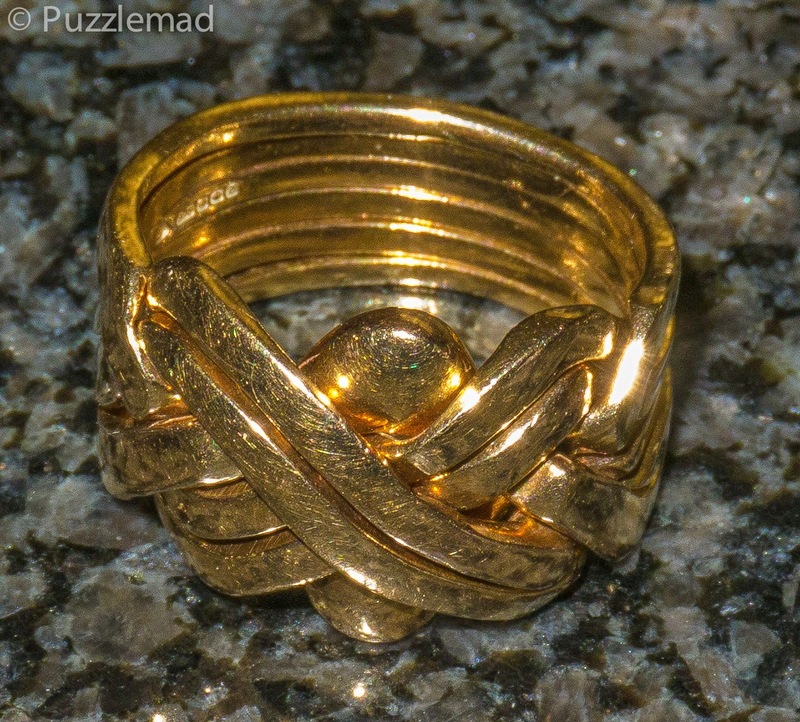 Unusually for a puzzle ring this one has an odd number of bands in it and this certainly threw me. I was expecting a similar mechanism to my 6 band ring and this was far from correct! After the obligatory photo (these shiny things are REALLY hard to get a nice photograph of! ), I sat down with a mug of tea expecting a decent challenge. I was a bit miffed to find that I had it reassembled in under 2 minutes. This one is definitely not a level 9 - more of a 5 or 6 on the Puzzle Master scale. I looked at the reviews by Brian and Gabriel and saw that my experience was much the same as theirs - both had solved it pretty fast. So, should you buy this one? Well I would say that it is only worth buying if you intend to give it to complete puzzling beginners or children to solve or if you intend to collect the whole Hanayama series. It is quite shiny and will look good on display but is not much of a challenge to the hardened puzzler. Having said that, it is only $13! You certainly won't need a solution but if you want one for the collection then download it from here. 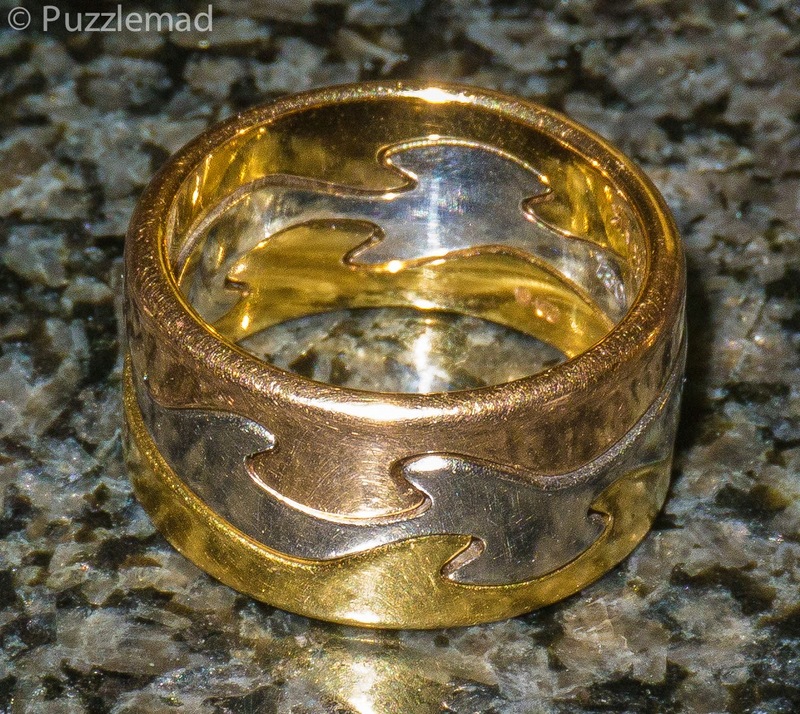 Now that is a much more challenging puzzle ring!